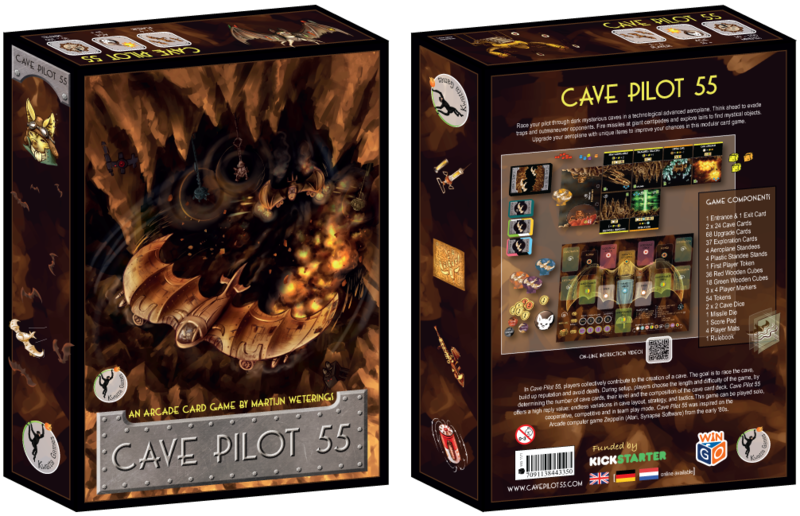 A table containing a summary and some tips for playing Cave Pilot 55 can be downloaded here. 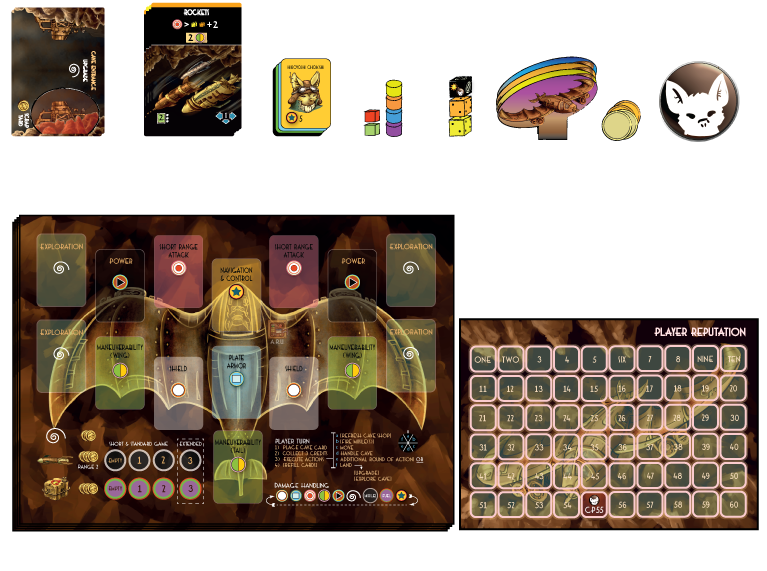 Players race their sophisticated technological bat-planes though a gauntlet cave in this thrilling 'Arcade' card-board game, for 1-4 players. The goal of this game is to finish alive and to gain reputation during the race. Each turn, a player puts a cave card on the table representing either the ceiling or the ground of the cave. 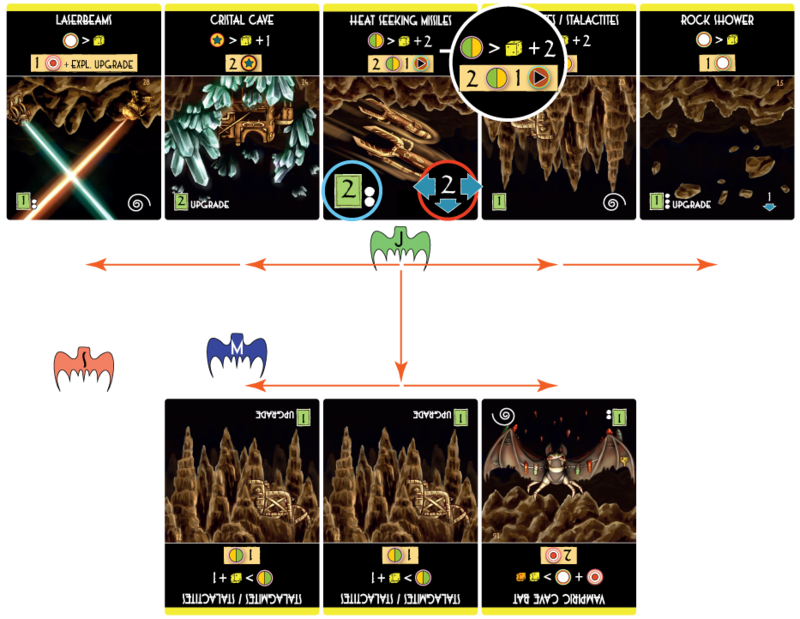 By doing so, a long small cave is created (with a different layout each game), through which players fly their technological bat planes. 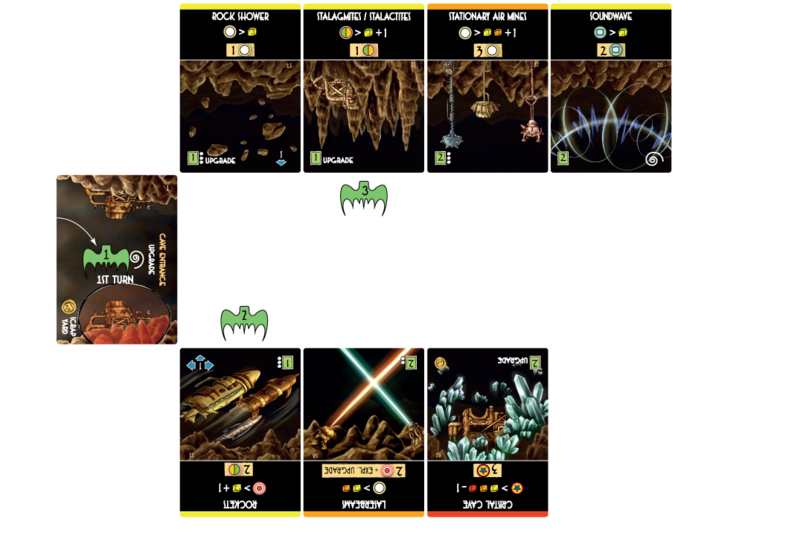 The game in the core box consists of 48 cave cards (belonging to two levels of difficulty), on which different dangerous objects or animals (vampiric bat, carnivorous plants, laser beams, etc) are shown, which could be encountered during the game. Encounters can be won (reputation can be gained) or lost depending on the strength and equipment of your bat-plane. 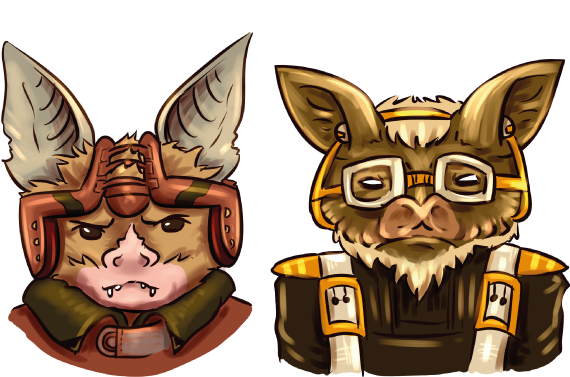 Players can strengthen their bat-planes by upgrading their shields, short-range attack, plate armor, power, maneuverability and navigation & control. There are 105 upgrade cards in total, including a set of exploration cards. Upgrade cards can be placed on a player mat in front of the players. Each player should critically consider in which plane characteristic he or she would invest his or her money. This depends on the cave cards on the table. But as the game continues and the cave is getting longer and more dangerous, the need to invest in certain plane characteristics may change. Not only can players invest their money in upgrade cards, they can also decide to buy long-range missiles or booster fuel. The long-range missiles can be used to shoot rivals, caves and obstructions. Booster fuel is used to outmaneuver other players by playing an extra turn or move diagonally. Some cave locations also offer the possibility to explore the local environment, and with a bit of luck you might find special upgrades there. During each turn many tough decisions need to be made, e.g. : should I fly via the ceiling or via the cave floor, which cave card should I play, should I invest in upgrade cards and if so what characteristics should I strengthening, should I play an extra turn, and many, many more. 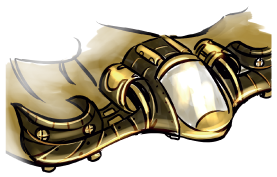 Cave pilot 55 is a tactical game, thrilling to the last turn, based on a few simple rules and placed in a steampunk technological world. Experience the gauntlet yourself! First, determine the amount of cave cards each player places face up, in front of them and the number of cards in the cave card pile, using Table 1.1. Shuffle each color for the cave card pile separately. Distribute the number of Yellow cards to each player. Now place the Orange cards on the bottom and Yellow cards on top. The score mat is placed at a central position on the table, together with one bat-token in each player’s color (to track each player’s reputation). The cave entrance card is placed on the table between the players. Each player puts his or her bat-plane in front of the entrance. All upgrade cards are split into two piles: ‘Normal’ upgrades (= upgrade card pile) (N=68) and Exploration upgrades (N=37). Shuffle each pile well and place them both face down on the table.  Draw the top six Normal Upgrade cards from the upgrade card pile, and place them in the cave shop in order from left to right (see Figure 1). Players can get upgrades in two ways: 1) pay and collect ‘normal’ upgrade parts from the cave shop, 2) explore, find and collect ‘exploration’ upgrade parts at caves. Each player takes one player mat and equips their planes with booster fuel and (long range) missiles, using two markers in the player’s color. The quantities are determined from Table 1.2 or a predefined scenario and vary with game length. 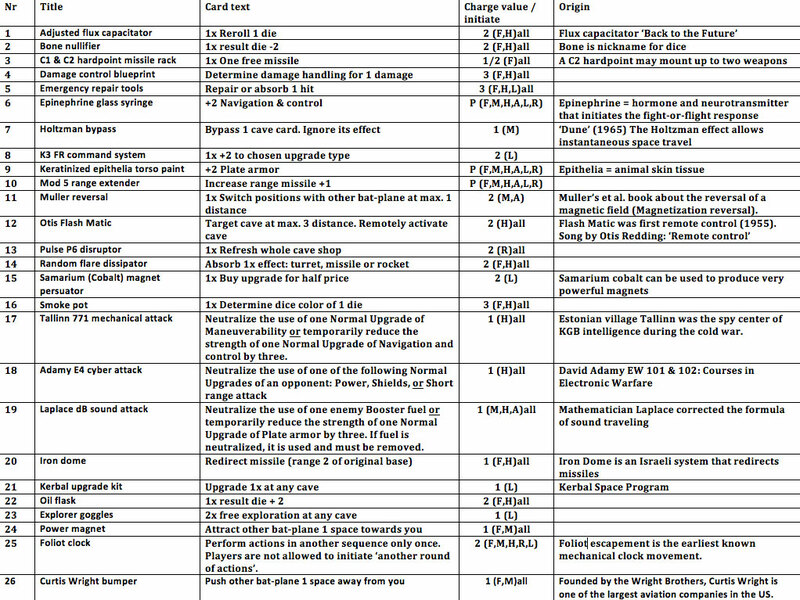 All players collect eight credits, one exploration upgrade card and their corresponding cave cards (see Table 1.1). All cave cards are put on the table in front of the players, visible for all players. Before the start of the race, the player sequence needs to be determined. All players throw a yellow die with highest roll going first. Re-roll in case of ties. The first player gets the first player token with player turns going in clockwise order. Players can play solo, against each other, in teams or in a cooperative variant (see play variants). During their first turn players move their bat-plane into the cave entrance, where they can upgrade and explore the surroundings. To prepare for the inner cave, players may choose to spend their second turn in the cave entrance as well. Only if they visit the scrapyard, players are allowed to spend their third and final turn in the cave entrance, otherwise they must enter the inner cave. Paying a visit to the scrapyard will cost one credit. Player movement in the inner cave is limited to one cave level; the cave ceiling or the cave floor. When players enter the inner cave, they have to make a choice to which side their bat-plane will enter the inner cave. In Figure 2 an example is shown where the green player made a choice to first follow the cave floor when entering the inner cave in his third turn, going up to the ceiling in the fourth turn. Standard equipment of every bat-plane is the Autopilot Response Unit (A.R.U.) that allows bat-planes to navigate through the cave without a real pilot, allowing a basic response to unexpected hostile activity. However, real pilots greatly improve the navigation and control of the bat-plane. Cave cards (see Figure 3 for their layout) are placed on any one of the two sides of the cave, always ‘touching’ (i.e. adjacent) the last cave-card in the row (see Figure 2). Players can always build caves in any color available in ‘their hand’. If the last cave is placed on the table, the cave exit is placed adjacent and in the middle of the last (outermost) cave card in the row, representing the finish of the race. Shield, plate Armor, short range Attack, Maneuverability, Power, Booster Fuel & Navigation & Control (from left to right). Each turn a player receives three credits (orange = 3 credits, yellow = 1 credit). Remove the upgrade card from the first position. Slide the remaining upgrade cards in the cave shop to the right (see Figure 1) (maintaining their order). If there are less than six upgrade cards in the cave shop, refill the last position(s) with a new upgrade card from the upgrade card pile up to six upgrade cards. Firing missiles is an optional activity. The player may target other players or cave cards in this phase. Missiles are fired from long range in the inner cave as opposed to a short range attack, which is used in the cave handling phase. To attack, pick a target (player or cave card) in any direction within range of two or less cave cards away. Range is calculated from the cave before movement was initiated. Objects in the entrance or exit may not be targeted. After picking a target, roll the black die. The number on the black die indicates the number of hits. If the black die shows a die symbol together with the value one, the attacker may re-roll the black die and add the new result to the total damage.  Sometimes the black die will also show either a targeting or a reputation symbol. If an opposing player is being attacked and the black die lands with the Targeting symbol showing, the attacker chooses which normal upgrade was hit. Without targeting symbol the Shields of the other player are hit first, and hits then follow the normal order for damage handling. If an opposing player is being attacked and the black die lands with the Reputation symbol showing, the attacked player loses one Reputation point on top off the total number of hits dealt by the missile. Caves cannot be targeted and do not lose Reputation. If a cave is damaged, place a red marker on the card. This marker indicates that during cave handling (explained below) one is subtracted of the number thrown. If a cave takes multiple damage, the effects are cumulative. Movement is performed along the cave ceiling and floor cards. Bat-planes may only move as shown in Figure 2 to displayed cave cards. They may move horizontally to the next floor or ceiling tile, move vertically to the cave tile either above of below them or move diagonally. Moving diagonally requires one Booster Fuel. Each Cave card can only be visited once. 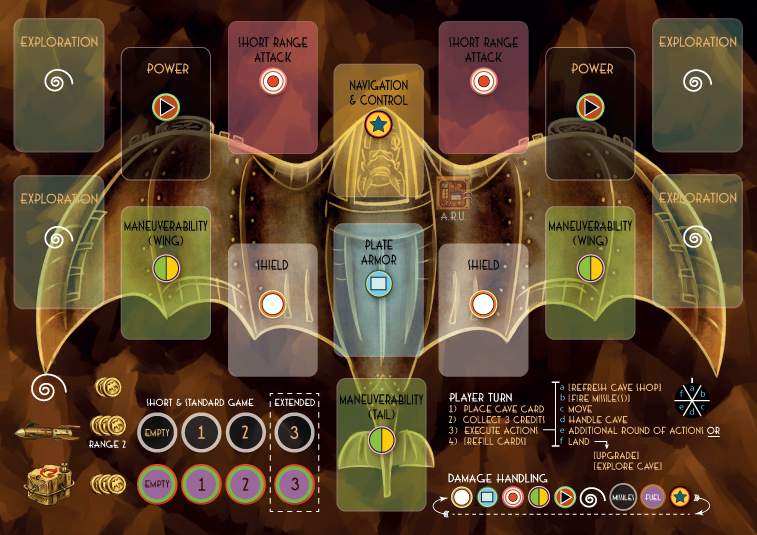 Bat-planes are allowed to stay at a cave card for only one turn with the exception of cards marked “Upgrade” on which bat-planes may stay for a maximum of two turns. Each time a player enters a new Cave card with their bat-plane, they must check the equation to determine the effect of entering. If successful, they earn reputation but if not, their bat-plane is damaged. Each Cave Card has symbols representing a challenge to be beat. Beating a challenge gains reputation points while failing will cause the bat-plane to be damaged. Some Cave Cards have challenges that affect other players within a range. The challenge is represented by an equation. Each equation shows a property of the Bat-plane on the left, a mathematical symbol and then a die or dice, sometimes with a number added as well. To pass a test, you read the equation and check the result. To pass this challenge, compare the value of your Maneuverability to the value shown when throwing the yellow die and adding two. If your maneuverability is greater than the yellow die value plus two, you pass the challenge. In this challenge, the player throws the yellow and orange dice. If that value is less than the sum of Shields and Short Range attack, the challenge is passed. Note that some challenges happen more than once. The number of white dots shown on the cave card shows how many times players need to resolve the challenge. The number of challenges always equals the number of white dots, regardless if a challenge is passed or failed. 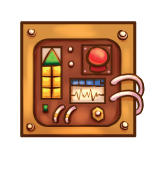 If the challenge is passed, the player gains the number of reputation points (RP) shown on the cave card. If the challenge is failed, then the damage applies. Damage is usually a loss in parts, or a reduction of their value, tracked by the red markers. Note that rewards or damage apply each time a challenge is taken so a player could earn a reward and take damage if they pass then fail a two-challenge card. If throwing the dice results is a negative number after performing a calculation, the challenge is automatically successful. Some card challenges have a range so entering a new card could benefit or damage an opponent. To determine range, look at the range value on the cave card and count that many cards in the direction(s) indicated. In Figure 6 a card is shown with Range two. This would affect the two cards to the right and left on the same level but also cross down to the card directly below and then one more (to get to two) both right and left. Seven additional cards would be affected, four on the same level, three on the opposite level. The number of challenges remains constant. So while a non-ranged card with a two-challenge affects the player on the card twice, with a ranged card, any multiple actions are effectively spread out. The initiating player is attacked first, then the closest, then the next closest, etc. until all the card’s actions have been taken (see example action). If two players are at an equal distance, each rolls a yellow die with low roll being attacked. If there are not enough players in range then the attack resume on the first player and the cycle repeats. Ranged effects do not affect the cave entrance or exit. For example if a player gets two hits on its Short range attack but they do not have any Short range attack upgrades installed, the hits are removed from any available Maneuverability upgrades, the next in line in the damage handling sequence. When there is no Navigation & control upgrade available, damage handling starts all over again affecting Shield upgrades first. Upgrade cards are destroyed only if the number of hits taken is equal to or larger than the card’s value or the value left. So one hit results in an upgrade card reduced by one or an exploration card reduced by one. Red markers are used to track these reductions. Players are dead if they get hit and do not have any upgrades installed to reduce or end up in a dead end. A player may choose to do another round of actions before ending their turn. For each additional round of actions, players must place an extra cave (if available) and pay one booster fuel. No credits can be collected in the additional action. Upgrades are technological aids that can improve the bat-plane or the pilot’s abilities. A player may upgrade their bat-plane only on Cave Cards that show “upgrade” on the card. Upgrades are technological aids that can improve the bat-plane. 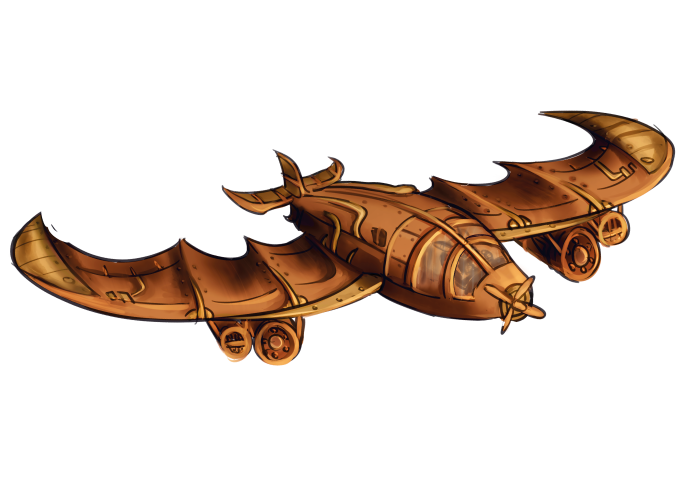 A player may upgrade their bat-plane only on Cave Cards that show “upgrade” on the card. During upgrading, players have three options. The first option is to sell unused Exploration Upgrade Cards. Players will get one credit for each use left, and three credits for Exploration upgrades that have a permanent character. Secondly, they may buy Booster Fuel and/or Missiles at a cost of three credits per unit. Only during an extended game are players allowed to buy and carry three Missiles and/or Booster Fuel. The third option is purchasing Normal Upgrade Cards from the shop. The cost of these shop upgrades is indicated on the card. For one credit each, players have the option to draw an extra Upgrade Card, which is then placed at the last position in the cave shop. If a player chooses to upgrade a part already installed on the bat-plane, only the difference needs to be paid. Upgrades cannot be downgraded or sold. Hits are permanent and cannot be removed with credits.  Players can only explore a cave if the corresponding cave has the exploration symbol (see Figure 3). For each exploration, pay two credits and draw the top card of the exploration upgrade pile. Exploration upgrades can be immediately installed on the player mat. Put an amount of green markers on an exploration card equaling the number of uses (see Figure 4). The exploration phase symbol (see Figure 4 and 5) indicates during which action phase an exploration upgrade can be used. Some exploration cards can only be used during a players’ own turn; others can be used during the turn of other players as well.  Exploration cards must be initiated and used before any dice roll when firing missiles or handling caves. Remove the green marker from the exploration card when used. Exploration upgrades that have a permanent (P) character (instead of a limited amount of uses) can absorb one hit. Players now refill their hands to three Cave Cards from the general Cave Card pile. If the last Cave Cards is placed on the table, the cave exit is used to close the cave. The score mat keeps track of all player’s or team’s reputation earned during the game. The game is over when a player reaches the cave exit, which is beyond the last Cave Card placed on the longest route. When a player (or team) finishes, all other players or teams have one last turn up to the player with the first player token. In this manner all players get the same number of turns. All players who reach the cave exit in the final round get an amount of bonus reputation points depending on the total cave length. 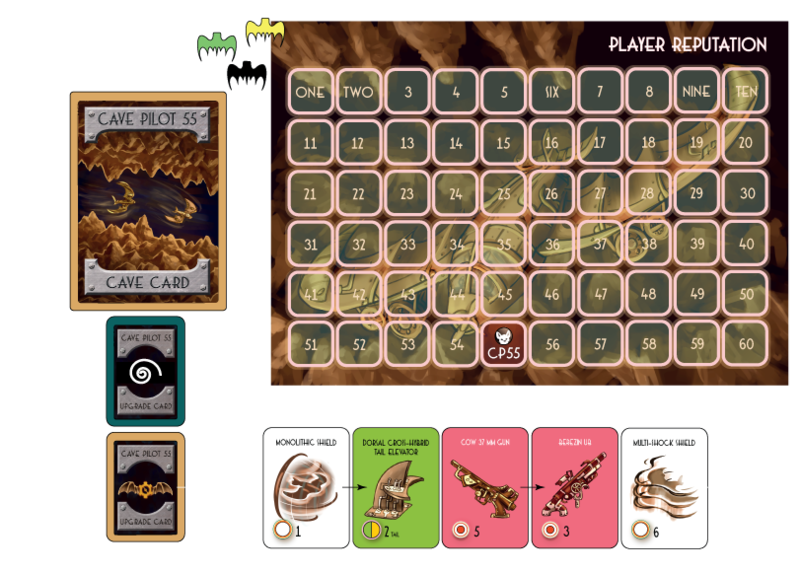 Players gain one bonus Reputation Point for each set of three cave cards in the cave. So for example, if the cave consists of nine cards, each finishing player would get three points. Players’ are granted the title: “Cave Pilot 55”, if they have collected 55 reputation points. Wind turbine: Throw a yellow die. Depending on the result, follow the upper or the lower line. If handled successfully, players earn reputation. If players are blown forward or backward (you can visit all cards again), they immediately need to handle the cave on which they arrive. Players decide themselves how their bat-plane moves forward or backward, counting the number of spaces from the wind turbine. If missiles hit the wind turbine, the number of hits reduces the cave handling and its range. For example one hit on the wind turbine reduces the cave handling by one. Additionally the range of the cave is reduced by one, meaning that players can be blown a maximum of one space backwards or forwards instead of the normal two spaces. Spider web: if missiles fire upon a spider web (or carnivorous plant), the attacking player can choose to target the web or the spider (similar for the carnivorous plant). Players that successfully handle the first part of the spider web (or carnivorous plant) may choose to continue and challenge the spider (or carnivorous plant). Bone nullifier: Can be used at any time to influence the dice results of other players. Muller reversal: After a reversal players do not have to handle the cave, but they are allowed to do if they wish. Reversals can also take place in entrance or exit. Otis flash-matic: Only caves with a ranged effect can be remotely activated, i.e. range> zero (i.e. not on own cave). The Otis flash-matic can be activated during another player’s action phase. Adamy E4 cyber attack: Reduce the Power, Shields, or Short range attack Upgrade card value during an opponent action by 2. Laplace dB sound attack: Reduce the Plate armor Upgrade card value during an opponent action by 2 or neutralize the use of one enemy Booster fuel. If fuel is neutralized, it is used and must be removed. Tallinn 000771 mechanical attack: Reduce the Maneuverability or Navigation and control Upgrade card value during an opponent action by 2. Foliot clock: Perform actions in any sequence (only once). Players are not allowed to initiate ‘another round of actions’. Power magnet / Curtis Wright bumper: The player initiating the power magnet or Curtis Wright bumper determines where the bat-plane of the opponent player ends up. If players are pushed forward or attracted backward, they immediately need to handle the cave on which they arrive. Attracting or pushing other bat-planes can also take place in entrance or exit. John’s green bat-plane moves from a crystal cave into a cave having heat-seeking missiles (see Figure 6 as well as Figure 3). John’s cave indicates that there are two heat seeking missiles that are going to be fired (white dots in blue inset), triggered by John, the moment he entered that cave. The missiles have a range of two (red inset). Calculated from John’s ‘missile’ cave, Marge (the blue player) can be affected, but Sophie (the red player) is out of reach. The first missile always targets the player triggering the event, in our case John. The second missile targets the player that is closest to John’s cave, in this case Marge. If there would be no other players in the neighborhood, John would be fired upon twice. Next, both players have to commence the cave handling (white inset), i.e. handling the effect of the missiles. The cave handling requires that John and Marge throw a yellow dice, add two, and compare this value to their Maneuverability value. The value of their maneuverability upgrades needs to be higher than the value of the yellow dice plus two. If successful, they gain two action reputation points (see blue inset), if unsuccessful, the missile hits two points worth of maneuverability and one point of power. Hits need to be indicated on the player mat, by the red cylindrical markers, or players can remove an upgrade when totally destroyed. When players do not have maneuverability upgraded, the hits will be dealt with according to the damage handling sequence, thus first the shields will be hit (if present) and so forth. The general rules are setup to cover the competitive mode, but Cave Pilot can also be played in team mode. Cooperative mode and solo play is mainly supported via specific scenarios. During team play, each individual player controls one bat-plane, additionally teammates coordinate their actions, discus their strategy and share reputation points. Whenever teammates are visiting the same cave, equipment (all types of upgrades) can be exchanged at the end of the turn, just before refilling the cave cards in their hand. Booster fuel, missiles and credits cannot be exchanged. 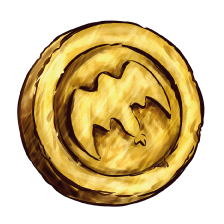 Faction abilities are unique abilities that players can collect by buying and mounting upgrades on their bat-plane. These unique abilities can be used at the moment a player collects the necessary faction symbols. There are two types of faction abilities: abilities that can be used once (white) and abilities that have a permanent use (black). If players want to use a one-time faction ability, they have to announce that to the other players, and mark this ability with a red cube. This ability cannot be gained anymore during the game. If players want to use a permanent faction ability, they also have to announce that to the other players, and mark this ability with a green cube. Faction abilities are lost when players loose a respective upgrade necessary for the faction ability. This could mean that the green cube of a permanent ability needs to be removed.If players gain an upgrade, two (or more) levels of unique abilities can become available at the same time. I.e. the amount of upgrade symbols of a specific faction determines which levels are unlocked; players don’t need separate units for each level. Faction abilities have to be activated before any dice roll when handling cave cards. For each level of faction abilities that is acquired by players, they get one reputation point. Particle clouds contain metal rock, scrap and other constructions, bound by a magnetic force floating in the cave. Players can fly through these clouds, but will be damaged by the particles. Magnetic particle cloud cards can be shuffled in the cave card piles matching their respective color. A magnetic particle cloud can be placed at least two caves from the foremost player (i.e. there must be at least one cave in between), albeit in the center of the two cave sides (i.e. between the cave cards). When a particle cloud only covers one side of the cave, the player in turn can choose which of the cave lanes is blocked. Firing a missile into a particle cloud opens up the cloud for a safer passage. Firing a missile into a particle cloud is similar to firing a missile towards a cave. If a particle cloud is hit, players earn reputation equaling the amount of hits. If a particle cloud is destroyed, remove it from play. These organisms consist of two or more cave parts. They will come into play just after the cave is closed. The large-sized beast card is placed at the cave exit, while the starting player takes the small-sized beast card. Every round, before his own turn, the starting player will throw a yellow die to advance the beast towards the cave entrance. If the yellow die shows anything but a five, the beast advances 1 cave towards the cave entrance. If the yellow die shows a five, the beast advances 2 caves towards the cave entrance. The beast will attack each player on either side of the cave when it passes through the cave. Players first have to handle this attack, before the starting player can start with the next round. Players can fire missiles to each part of the beast in order to weaken it, similar to firing missiles onto a cave card. When a player moves onto a cave card that contains a part of the beast, they will have to handle the beast first before they have to handle the cave. When the beast reaches the entrance, it will turn around and start flying towards the exit again, and so forth. Valentijn van Bergen, Simen Blokland, Franke Broersma, Flip Dinko, Nishal Etwarde, Sophie Ewert, Thijs Gerritsen, Jaap de Graaf, Tristan da Graça, Caroline van Gool, Eric Haakmeester, Rick Heeres, Dennis Hofland, Emily Ingham, Toin Koevoets, Boudewijn Kramer, Pauline de Kroon, Carlijn Laurijssens, Junior Lewis, Koen van Lieshout, Stefan Luchies, Wilfred Meijboom, Ben Meijer, Marijke de Nijs, Stef Noordermeer, Jeff Peereboom, Mark Rademaker, Daan Reid, Doeze Ruiter, Gerard Schonck, Tim Schonck, Bob Schubert, Dymphy Seegers, Tim Smedinga, Tariq Stark, Carola Suijs, Wiljan Toonen, René Vaes, Martijn van der Ven, Stephan Warnaar, Jeroen Weterings, Joost Willemse, Margerita Wilson, Benjamin Wit. Copyright 2017 © Cave Pilot 55. All rights reserved.